With a nickname like Hotlanta, you’d expect the temperatures to be scorching year-round in Georgia's biggest city. However, Atlanta actually enjoys a moderate climate with four very distinct seasons. While the summers can be hot and humid, the city also enjoys cool fall days, occasional snow and ice storms in the winter, and a beautiful spring season filled with blossoming flowers and temperate weather. Whether you're planning to move to Atlanta or you're just planning a vacation to experience its art and culture, knowing what to expect in terms of the weather can help you decide if the city is right for you or when's the best time to visit. Over the course of a year, the temperature typically varies from a low of 34 degrees Fahrenheit (1 degree Celsius) to a high of 89 degrees Fahrenheit (32 degrees Celsius), though it rarely goes to extremes, according to WeatherSpark. The average annual temperature in Atlanta is 61 degrees Fahrenheit (16 degrees Celsius), according to U.S. climate data, and the warmest month on average is July while the coolest month is January. Atlanta's record high is 106 degrees Fahrenheit (41 degrees Celsius), which was set in the summer of 2012, and the record low is 9 below zero, which was set in the winter of 1899. Atlanta averages of 48 days a year below freezing and 2.9 inches of snow annually, and the city also averages 47.12 inches of rainfall each year over 113 days, according to U.S. climate data. Rainfall is heaviest in July, averaging just over 5 inches, and lowest is in April, averaging nearly 3.5 inches. Conversely, it’s sunny 60 percent of the time in Atlanta. Springtime in North Georgia changes year to year—some years can be downright balmy, while others can seem more wintry. Early spring can be chilly during the day, with temperatures in above 60 degrees Fahrenheit (16 degrees Celsius), but as cold as 40 degrees Fahrenheit (4 degrees Celsius). This is among the rainiest times of the year as well and is also extremely windy. What to Pack: Pack your wet weather gear, including a waterproof rain jacket, an umbrella, and waterproof shoes, such as rubber rainboots. Atlanta's summers are hot and humid, with temperatures regularly exceeding 90 degrees Fahrenheit (32 degrees Celsius). Overnight is slightly cooler, especially in the mountains. Humidity is also a factor to consider when visiting Atlanta in the summers. While North Georgia isn't as humid as the state's southern reaches, summer thunderstorms are common and can add to the muggy feeling; these powerful storms can also bring up to five inches of rain per month. What to Pack: You'll only need light clothing for your summertime trip to Atlanta—even overnight lows will feel downright balmy for most visitors. Fall in Georgia is usually sunny, cool, and dry. September and October can still see quite warm temperatures—what is referred to as "Indian Summer"—with temperatures sometimes still reaching above 80 degrees Fahrenheit (26 degrees Celsius). The night is usually much cooler, averaging around 50 degrees Fahrenheit (10 degrees Celsius). The year's first frost typically takes place in November, but is sometimes as early as October, especially in nearby mountain elevations. What to Pack: Fall and winter are chilly, so clothing that can be layered in a good idea. Pack long pants of jeans, as well as pullovers, cardigans, sweaters, and a light coat or jacket. Georgia doesn't experience a truly severe winter compared to the northeastern United States, but the area does receive a little bit of snow, as well as cooler temperatures. True blizzards, however, are rare. Temperatures are much cooler than other times of the year and can dip below freezing. Overall, winter is quite dry with the exception of sporadic snowfall. What to Pack: You'll want to pack warm layers for winter in Atlanta. A heavy coat will come in handy occasionally, but in general, a medium-weight jacket with cool-weather accessories, like a scarf and gloves. 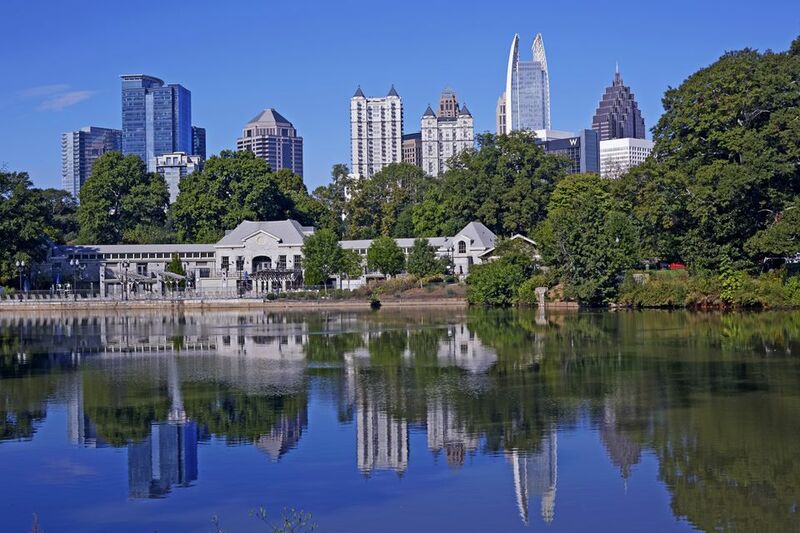 Atlanta is sweltering in the summer and experiences some snow and cold during the winter, but the city enjoys plenty of sunshine year-round.